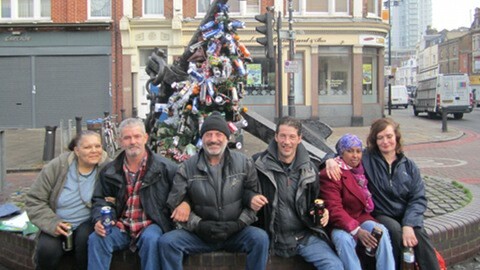 A Christmas tree decorated with empty beer-cans, tomatoes, carrots and a large umbrella on Deptford High Street has attracted a lot of attention from passers by. The Deptford dwellers that usually sit around the anchor sculpture on the high street made the unusual Christmas decoration after they found the tree in a car park on Monday night. Yonne McPolin, 41, who often sits by the anchor, said two of her friends came up with the idea when they found the tree nearby. Samila Mohamed, 24, who plans to spend Christmas around the anchor, said she and her friends had only tried to brighten up the landmark for Christmas.